For other people named James Milner, see James Milner (disambiguation). * Senior club appearances and goals counted for the domestic league only and correct as of 22:16, 4 December 2016 (UTC). James Philip Milner (born 4 January 1986) is an English professional footballer who plays for Premier League club Liverpool. A versatile player, he has been utilised in many different positions such as in midfield, on the wing and most recently at left-back. While at Leeds United, he spent time on loan at Swindon Town to gain experience as a first-team player. Following his move to Newcastle United, he was loaned to Aston Villa for a season. He went on to establish himself as a regular starter in the Newcastle, and later Aston Villa and Manchester City first teams. He made more than 100 appearances for Newcastle, as well as making a record number of appearances for the England under-21 team. He made his debut for the full team against the Netherlands in August 2009 and also played at the 2010 FIFA World Cup and UEFA Euro 2012. Born in Wortley, Leeds, Milner played most of his childhood football for Westbrook Lane Primary School in Horsforth. He was later educated at Horsforth School. Graeme Coulson, a coach from Rawdon, recognised Milner's talent and persuaded him to play for Rawdon in several tournaments, including a tournament at Rawdon Meadows, where Milner scored four goals in their victory in the final. I noted his name and it was one not to be forgotten. He was an outstanding talent scoring lots of goals but he was also very strong. Milner was described as a "first class" student at his school; he left with 11 GCSEs and an award for his performance in physical education. Milner also showed talent in cricket, sprinting and long-distance running. He played for the Yorkshire Schools cricket team, was the cross-country champion at his school for three consecutive years and was the district champion over 100 metres for two years in a row. He then completed his studies at Boston Spa School; at which the sports college was a partner to the football club. Milner supported his hometown club Leeds United from a young age. His earliest memory of the team was watching them win the FA Youth Cup in 1993. He and his parents, Peter and Lesley, were season ticket holders and Milner later became a ball boy for the club. When Milner was 10 years old, he joined the Leeds United Academy after being spotted by a scout while playing for Westbrook Juniors in Horsforth. At the academy, Milner played against contemporaries from other clubs in the north, including future Manchester United striker Wayne Rooney. His role model was Leeds-born Alan Smith, who was then a Leeds United striker. Milner believed playing with Smith put him through a learning curve, as Smith had done what Milner aspired to do; that is, to come through the academy and play for the first team. Having made good progress at the Academy, Milner was taken on as a trainee after leaving school. However, his father insisted that he attend college once a week to continue his education. Milner remarked later that he did not want to get excited and think that he had "made it". He also said he could hardly believe he was playing alongside first-team Leeds players such as David Batty and Olivier Dacourt. He continued to excel in the youth team, and played for England at under-15 and -17 levels. He helped the England under-17 team win the 2002 Nationwide summer tournament against Italy, Czech Republic and Brazil, scoring a goal against the latter. Milner claims to have never consumed alcohol throughout his life, despite pressures from those around him when he was growing up. 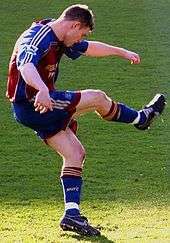 Milner's first-team debut for Leeds came on 10 November 2002, in a game against West Ham United, when he came on as a substitute for Jason Wilcox for the last six minutes. The appearance made him the second youngest player ever to play in the Premier League, at the age of 16 years and 309 days. On 26 December 2002, he became at 16 years and 356 days the youngest player to score in the Premier League, with a goal in a 2–1 win against Sunderland. His record was broken by James Vaughan of Everton. In a match against Chelsea a month later, Milner scored again, with a deft first touch of the ball and manoeuvre, in order to avoid a tackle from Chelsea defender Marcel Desailly, that won widespread praise from commentators. The manoeuvre created a yard of space for him to deliver a curling shot from 18 yards (16 m). Reporters were impressed by his overall performance in the game, especially by his desire, confidence, and ability with both feet. Chelsea manager Claudio Ranieri remarked after the game that Milner had performed like a much more experienced player. The performance prompted comparisons to England internationals Michael Owen and Wayne Rooney, who had also come to footballing prominence as teenagers. After more appearances for Leeds, Milner signed a five-year contract with them on 10 February 2003. At the start of the 2003–04 season, Milner was sent on a one-month loan to Second Division side Swindon Town to gain experience as a first-team player. Before the stint, he saw it as a valuable experience as a player. He spent a month with Swindon, playing in six games and scoring two goals against Peterborough United and Luton Town. However, Leeds' fortunes were on the decline; the team became the subject of numerous negative stories in the media, and several first-team players were sold. Milner said he believed that this experience made him emotionally stronger and taught him how to deal with team problems. Leeds's eventual relegation to the Championship led to speculation over Milner's future at the club. Tottenham Hotspur, Aston Villa and Everton all expressed an interest in signing him. Ultimately, Villa and Everton did not make offers and Milner rejected an offer from Tottenham as they were based too far from his family home, where he still lived. Leeds insisted that he would not be sold and the chairman of the club at the time even referred to him as "the future of Leeds". Nonetheless, financial problems eventually forced Leeds to sell Milner to Newcastle United for an initial price of £3.6 million. Although Milner was not happy to be leaving the club he had supported as a child, he wished to do what was "in the club's best interest" and in July 2004, he agreed a five-year contract with Newcastle. Milner made his first appearance for Newcastle United during their pre-season tour of Asia, scoring his first goal for the club in a 1–1 draw against Kitchee, in Hong Kong. During this tour, he took the opportunity to observe how Newcastle striker Alan Shearer dealt with attention from fans and the media. He said that his association with people like Shearer gave him a better idea of how to deal with the media. Milner's first Premier League game for Newcastle came against Middlesbrough on 18 August 2004, in which he played on the extreme right of the field as a winger, despite having featured regularly on the left for Leeds. When asked about this after the match, Milner said he had no preference where on the pitch he played. A month later he made his debut in European competition, when Newcastle played in the UEFA Cup against Bnei Sakhnin from Israel, after coming on as a substitute for Shola Ameobi. In the same month, he scored his first competitive goal for the club, also as a substitute, in a 3–1 win against West Bromwich Albion. It looked probable he would soon start a game. However, the situation changed for Milner after Newcastle manager Bobby Robson, whom Milner considered his mentor, was sacked and replaced by Graeme Souness. Under Souness, he started 13 league games, but did not play his first full Premier League game for Newcastle until April 2005. By the end of the season, he had made 41 appearances in all competitions and scored once. Souness did not make Milner a regular in the Newcastle side and controversially remarked that the club would not win "with a team of James Milners". Milner's response to this statement was reported as "mature". He did however confirm that he was frustrated at not being used as a starter for most of the season. At the start of the 2005–06 season, Milner scored in Newcastle's 3–1 away win against FK ZTS Dubnica in the UEFA Intertoto Cup, and also set up Alan Shearer for the team's third goal. His good run of form in this competition continued when he scored in the next round against Deportivo La Coruña. Despite these goals, a clause in Newcastle's purchase of Nolberto Solano from Aston Villa resulted in Milner being loaned to Villa for the rest of the season. Villa manager David O'Leary, who had managed Milner at Leeds, was happy to acquire Milner in this deal, saying that he believed Villa got the better of the deal and that he hoped to improve him as a player. Milner made his Villa debut on 12 September 2005 in a Premier League match against West Ham United. Five days later, he scored his first goal for the club in a 1–1 draw against Tottenham Hotspur. In a League Cup game less than a week later, he helped his side recover from being 3–1 down at half-time to win 8–3 against Wycombe Wanderers, scoring two goals in the second half comeback. Throughout the season Milner was positive about his team. He remained confident that Villa would recover from a poor start to the season and praised the quality of the squad. Milner was generally seen as a positive signing in a season that was disappointing for Villa. Milner himself also received the loan move positively, saying that he would like to join Villa permanently because of the probability of becoming a regular starter, but admitted that the possibility of this happening was beyond his control. Manager David O'Leary confirmed during the season that he would like Milner to join the club permanently, but doubted he would be given the opportunity to sign him. He even pulled out of signing Robert Huth so that he would have the funds to sign Milner permanently if the opportunity arose. Shortly before the end of his loan period, negotiations between Villa and Newcastle began. The newly appointed Newcastle manager Glenn Roeder appeared to appreciate Milner's ability more than Souness and expressed a desire that he remain a Newcastle player. This, as well as the departure of O'Leary and the shortage of transfer funds at Villa, meant that a deal to sign Milner permanently seemed unlikely. In June, it became even less likely when Villa rejected an offer of Milner as part of a trade for Gareth Barry. However, the deal was resurrected when Villa were taken over by American billionaire Randy Lerner, and Martin O'Neill was appointed as new Villa manager. Villa made an improved offer on 30 August, which was accepted by Newcastle chairman Freddy Shepherd. Media sources quoted the transfer fee as being £4 million. A move to Villa appeared to have been agreed, but at the last moment Newcastle recalled Milner and the talks broke down. Newcastle's players and manager Glenn Roeder reacted positively to Milner's return at the start of the 2006–07 season. Roeder praised Milner for the way he had handled the failed Villa transfer, although Roeder's own handling of the negotiations was criticised. Roeder confirmed that he would play Milner in "plenty of games" during the season. This proved to be the case, as Milner was a starter in the Newcastle side for the entire season. Newcastle made a poor start in the Premier League, but in European competition, Milner played a key role in helping Newcastle advance through the group stage of the UEFA Cup. Shortly after, rumours began to spread that he would be sold during the transfer window in January, although both Milner and Roeder dismissed these rumours. On 1 January 2007, Milner scored his first goal of the season in a 2–2 draw with Manchester United. The goal came from a "stunning" shot from 25 yards (23 m) away. He scored two more goals during the next three weeks, against Birmingham City and then against West Ham United. Both of these were scored from at least 20 yards (20 m) away. Later in the season, Roeder praised the progress Milner had made and said that he believed him to be the hardest-training player at the club. Also during the season, Milner displayed his ability to play comfortably in a range of different positions by scoring and setting up goals with both feet from both sides. As a result, Milner signed a new contract at Newcastle in January, which secured his future at the club until 2011. He signed another four-year contract in May 2007, when Sam Allardyce took over as manager of Newcastle. Milner said later in the year that he was happy about his future at the club and its new manager saying that the training sessions were "the best since I have been here". Allardyce said during the season that Milner was so keen to play, that he was concerned he would "burn out mentally [and] physically". As a result, Milner played mainly as a substitute in the early part of the season. In late October, he scored Newcastle's 500th home Premier League goal in a 3–1 win over Tottenham Hotspur. A second Premier League goal of the season came fortuitously in the Tyne–Wear derby from a shot intended as a cross. Allardyce praised Milner highly during the season, saying he was "a hugely experienced Premier League player". After missing the final nine games of the season due to a foot injury, it was rumoured in May 2008 that he would be part of a transfer between Newcastle and Liverpool. Despite starting the season for Newcastle and scoring in a League Cup win over Coventry City, it was revealed after the game that Milner had handed in a written transfer request the week before. Milner signed for Aston Villa on 29 August 2008 for a fee of £12 million, and signed a four-year contract with the club. Milner made his debut for Villa on 31 August 2008 as a second-half substitute against Liverpool. His first goals in his second spell at Villa came in a third round FA Cup tie against Gillingham at Priestfield Stadium on 4 January 2009 on his 23rd birthday, where he scored both goals in a 2–1 win for Villa. On 9 January 2009, Milner scored both goals as Villa beat Gillingham 2–1 in the third round of the FA Cup. Milner's first Premier League goal in his second spell at Villa came on 17 January 2009 in a 2–1 win against Sunderland at the Stadium of Light. On 7 February 2009, Milner was named to the England senior team squad for the first time, after a run at club level that had impressed England manager Fabio Capello. Milner continued to impress and scored his second league goal of the season against Blackburn Rovers on 7 February and scored a free-kick from outside the penalty area at home against Everton as Villa came back from a 3–1 deficit to draw 3–3 on 12 April. He stated that his time at Villa is the "most settled" period of his career so far, having played under thirteen managers and caretakers despite being only 23. 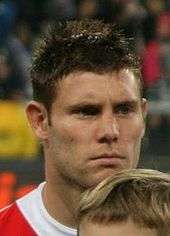 At the start of the 2009–10 season, Milner moved into the centre of midfield after the sale of captain Gareth Barry to Manchester City. On 28 February 2010, he scored the opening goal in the 2010 League Cup Final with a penalty. However, Villa were eventually beaten 2–1 by Manchester United. Milner ended the season with 12 goals and was named Aston Villa's Fan's Player of the Year and PFA Young Player of the Year. On 19 May 2010, Manchester City made a £20 million offer for Milner which was rejected. 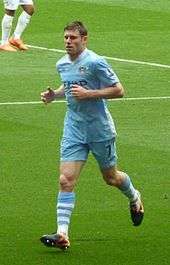 On 22 July 2010, Villa manager Martin O'Neill said that Milner had shown a desire to leave Villa for City, but would only be sold at Villa's valuation. On 14 August despite being on the verge of a move to Manchester City, Milner played in Villa's first game of the season against West Ham United, scoring Villa's third goal. Milner was given a standing ovation when he was substituted near the end of the game. On 17 August 2010, it was reported that Aston Villa had agreed a deal with Manchester City to sell Milner subject to a medical. The deal was reported to be worth around £26 million, including a player exchange of Stephen Ireland. Milner made his debut for City on 23 August 2010 in a 3–0 home win against Liverpool, where he set up the first goal for former Villa teammate Gareth Barry. Milner scored his first competitive goal for Manchester City in an FA Cup third-round match at Leicester City which ended in a 2–2 draw. The Leicester match was the start of a cup run that saw Manchester City reach the 2011 FA Cup Final. Milner was an unused substitute as Manchester City beat Stoke City 1–0 to win the cup. Milner scored his first Premier League goal for Manchester City against Everton on 24 September 2011. Two matches later, he scored his second, against former club Aston Villa in a 4–1 win. The following week, Milner had a hand in two goals as Manchester City won the Manchester derby at Old Trafford 6–1, inflicting Manchester United's heaviest home league defeat since 1930. On 3 January 2012, Milner scored his third goal of the season, a penalty, against Liverpool. Manchester City won the match 3–0. Over the course of the 2011–12 season, Milner made 26 Premier League appearances as Manchester City won the league title for the first time in 44 years. On 6 October 2012, Milner scored his first goal of the 2012–13 season from a free-kick to seal a 3–0 win against Sunderland. On 20 October, he received his first Premier League red card in a 2–1 win at West Bromwich Albion. On 28 November, he scored away at Wigan Athletic in a 2–0 win for City. On 13 January 2013, he scored City's opening goal in a 2–0 away win at Arsenal, it was the first time a City player had scored away at Arsenal in the League since 2007 and City's first win in the league at Arsenal since 1975. On 8 April, he scored in the Manchester derby as City beat Manchester United 2–1 at Old Trafford. On 10 December 2013, Milner scored the winning goal in a 3–2 win against the reigning European champions Bayern Munich at the Allianz Arena in the UEFA Champions League, becoming the first English player to score for Manchester City in the competition that season. On 4 June 2015, Milner agreed to join Liverpool on a free transfer from Manchester City. 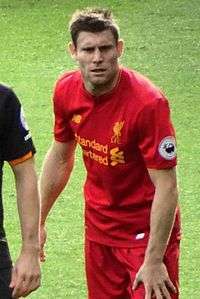 On 7 August 2015, Milner was announced as the vice captain. Milner played his first competitive match for the club in 1–0 win over Stoke City at the Britannia Stadium. Milner captained Liverpool for the first time on his third appearance for the club, a 0–0 draw at Arsenal. On 26 September 2015, he scored his debut goal for Liverpool in a 3–2 win against his former club Aston Villa at Anfield. Milner ended his first season with Liverpool scoring 10 goals in all competitions. So far in the 2016-17 season Milner has played eleven times for the club winning on seven occasions. In those games he scored five goals and made one assist. After representing England at the under-15 and under-17 levels, Milner was promoted to the under-20 level and called up for the 2003 World Youth Championship. Soon after this, under-21 manager Peter Taylor called him up to the England under-21 team and Milner made his debut against Sweden on 30 March 2004. Milner scored his first goal for the England under-21 side during the 2004–05 season in a qualification game for the 2007 UEFA European Under-21 Championship, against Wales. During the game, in which he played in the centre of midfield, he also set up a scoring chance for Darren Bent as the Young Lions won 2–0. Despite domestic club troubles, he continued to make progress at international level, scoring the winning goal for the England under-21 side in a 3–2 win over Switzerland. The win secured England a place in the playoff stage of the 2007 UEFA European Under-21 Championship qualifiers. In June, Milner competed for England at the 2007 UEFA European Under-21 Championship. He played in all four of England's matches and was booked in the semi-final against the Netherlands, which meant he would have missed the final. The game was decided by a penalty shoot-out, in which Milner scored twice and England lost 13–12. Milner was included in the under-21 squad for a friendly against Romania, which ended in a 1–1 draw. A month later, Milner set an England under-21 record by making his 30th appearance for the side in a 3–0 win against Montenegro. During this game, he set up the first goal from a corner. Historically, players with several England Under-21 appearances have not progressed to become regulars in the senior side, which has led some to doubt whether Milner would be able to successfully make the transition. In October, he scored his third goal for the under-21 side in a 3–0 win over Republic of Ireland. He scored again in the return game four months later that England also won 3–0. Milner continued to be a regular and was the only player, along with Joe Hart and captain Steven Taylor, to have played in all the qualifiers for the 2009 UEFA European Under-21 Championship.In the summer of 2009, he was in the final 23-man U21 squad for the 2009 UEFA European Under-21 Championship in Sweden. He helped set up the winning goal for Micah Richards against Finland, and manager Stuart Pearce said after the match, "The modern-day full-back can get up and down the pitch and I knew [Milner] would be comfortable". In England's second match against Spain, Milner had a penalty well saved by Sergio Asenjo, and scored England's second goal in a 2–0 win. England faced the hosts Sweden in the semi-finals. In the first minute of the match, Milner delivered a corner that was headed in by Martin Cranie to give England the lead. Another corner from Milner would set up England's third goal, an own goal by Mattias Bjärsmyr. After the match ended in a 3–3 draw, it went to a penalty shoot-out. Milner was the only England player to miss in the shoot-out after he slipped just before kicking the ball, causing it to sail over the crossbar. England won the shoot-out 5–4 to advance to the final for the first time in 25 years. England lost the final to Germany 4–0 and Milner said after the match that the team was "hurting" and that the way in which the team lost was "not good enough". The final was his last game for the under-21 side. His 46 appearances at under-21 level are a national record. In August 2009, Milner made his debut for the England senior team, when he came on as a substitute in a friendly match against the Netherlands for the final 23 minutes. The match ended in a 2–2 draw. He played twice more for England the following month against Slovenia in another friendly and made his competitive debut four days later in a 2010 FIFA World Cup qualifier against Croatia, where he played the final nine minutes. England won the latter match 5–1 to secure qualification for the 2010 FIFA World Cup. He was named in the final 23-man squad for the World Cup finals in South Africa and was selected in the starting eleven for England's first match of the tournament against the United States, however he was substituted after 30 minutes. In England's third match against Slovenia, he set up the only goal of the match with a cross for Jermain Defoe. He captained England for the first time for the final 10 minutes of the match in a 2–1 loss against France on 17 November 2010, when both Rio Ferdinand and Steven Gerrard had been substituted. Milner played in six matches during qualifying for UEFA Euro 2012, and was named in Roy Hodgson's 23-man squad for the tournament. Milner started Hodgson's first match in charge, a 1–0 friendly win against Norway. On 7 September 2012, Milner scored his first international goal in a 5–0 win away to Moldova during 2014 FIFA World Cup qualifying. On 5 August 2016, Milner announced his retirement from international duty following discussions with new England manager Sam Allardyce. Milner is regarded as being a tenacious footballer. As a result, his main role on the team is as a wide midfielder who creates scoring opportunities, as well as taking the ball past defenders. He could be deemed a traditional English winger. While Milner does not score many goals, he does have a good record at providing assists. Nolberto Solano, a former teammate, said that because of his ability, Milner would "become an important team player". After his move to Newcastle, he began playing more as a winger. He has been described as "comfortable on either wing". He has also been used occasionally as a central midfielder, a striker and as an emergency right-back, generally during an injury crisis. Manuel Pellegrini, who managed Milner at Manchester City, described Milner as the most complete English player in the modern game praising his all round ability, commitment, performance level and versatility. Milner has the ability to pass accurately and shoot from a great distance from goal. As a result, he usually goes forward for set pieces and is often a candidate to take corners and free kicks. Critical opinion is divided as to Milner's crossing ability. While some commentators have been critical of his ability in this area, other journalists have said that Milner can produce accurate crosses. All my life I've wanted to do what I'm doing now. Now I'm here, and enjoying every minute of it. You've got to make a few sacrifices, but I don't mind that. Milner, in his time at the club, was described on the Newcastle United official website as "a good reader of the game". One quality that is praised by commentators is Milner's awareness of players around him. He is a very tactically aware player. This awareness allows him to pass the ball from a range of positions to teammates making forward runs, as well as giving him the confidence to take on defenders. His awareness and willingness to pass have been called mature for a player of his age. Milner has expressed a willingness to play as much as possible and feels that Wayne Rooney's move to Manchester United and success as a player has taken a lot of pressure off his own career, commenting, "I have been able to concentrate on football and ignore everything else". During his career, Milner has been booked 15 times and been sent off once, against West Bromwich Albion on 20 October 2012. Despite being a winger by trade, Aston Villa manager Martin O'Neill stated in November 2009 that he thought Milner's versatility could lead to him becoming an accomplished central midfielder at some point in his career. Milner played in a number of different positions for Aston Villa, including both wings, in central midfield and even as a right back. England score listed first, score column indicates score after Milner goal. 1 2 3 Hugman, Barry J., ed. (2010). The PFA Footballers' Who's Who 2010–11. Edinburgh: Mainstream Publishing. p. 289. ISBN 978-1-84596-601-0. ↑ Stewart, Rob (10 May 2010). "James Milner: England midfielder at World Cup 2010". The Daily Telegraph. London. Retrieved 22 April 2016. 1 2 3 4 5 6 7 "James is the latest teenage soccer hero". Craven Herald and Pioneer. 31 December 2002. Archived from the original on 19 May 2010. Retrieved 28 July 2007. 1 2 3 4 Collins, Roy (9 September 2007). "James Milner keeps feet on the ground". London: Sunday Telegraph. Retrieved 9 September 2007. ↑ "Come on and join the girls". Yorkshire Evening Post. Leeds. 10 May 2004. Retrieved 3 December 2011. ↑ "Leeds United Foundation". Boston Spa School. Retrieved 3 December 2011. 1 2 3 4 5 6 7 Shaw, Phil (31 December 2005). "James Milner: 'Players my age want to play in the World Cup. I'm no different'". London: The Independent. Retrieved 19 January 2011. 1 2 3 Townsend, Nick (4 January 2004). "The birthday boy in a very different world from Wayne". London: The Independent. Retrieved 19 January 2011. ↑ Wrigglesworth, Dave. "Profile of James Milner: aged 14 years". Horsforth School website. Retrieved 9 September 2007. ↑ "Milner magic seals Nationwide Glory". The FA. 14 July 2002. Retrieved 28 July 2007. ↑ Brenner, Steve (19 June 2009). "Leeds and Toon couldve driven me to drink but Ive never touched a drop". The Sun. London. 1 2 3 "16 James Milner – Midfielder". ESPNsoccernet. Retrieved 28 July 2007. ↑ "The Premiership's youngest guns". BBC Sport. 27 December 2002. Retrieved 11 August 2007. ↑ "Youngest Premiership goalscorers". BBC. 11 April 2005. Retrieved 18 September 2009. ↑ "Goal of the week – Master Milner's class act". BBC Sport. 22 December 2002. Retrieved 13 September 2007. ↑ Taylor, Daniel (30 December 2002). "Milner fills Leeds with teen spirit". London: The Guardian. Retrieved 28 July 2007. 1 2 Lawrence, Amy (28 December 2002). "Magical Milner". London: The Guardian. Retrieved 28 July 2007. ↑ "Milner signs Leeds deal". BBC Sport. 10 February 2003. Retrieved 11 August 2007. ↑ "Swindon 2–0 Peterborough". BBC Sport. 27 September 2003. Retrieved 3 September 2009. ↑ "Swindon 2–2 Luton". BBC Sport. 1 October 2003. Retrieved 3 September 2009. ↑ "Milner plots Leeds deal". BBC Sport. 13 May 2004. Retrieved 23 August 2007. ↑ Lucas, Ed (25 July 2004). "Versatile Milner may be right for the England left". The Independent. London. Retrieved 19 January 2011. ↑ Pearson, James (19 July 2004). "Robson delight at Milner impact". Sky Sports. Retrieved 29 July 2007. 1 2 O'Rourke, Peter (18 August 2004). "Milner makes Magpies vow". Sky Sports. Retrieved 21 August 2007. ↑ "Newcastle 2–0 Bnei Sakhnin". BBC Sport. 16 September 2004. Retrieved 7 October 2007. ↑ "Newcastle 3–1 West Brom". BBC Sport. 25 September 2004. Retrieved 23 August 2007. 1 2 McNally, Brian (15 May 2005). "Football: Roo takes the heat off James". Sunday Mirror. London. Retrieved 19 September 2007. ↑ Buckingham, Mark (29 March 2005). "Milner's Magpies hope". Sky Sports. Retrieved 10 September 2007. ↑ "ZTS Dubnica 1–3 Newcastle". BBC Sport. 17 June 2005. Retrieved 29 July 2007. ↑ Pearson, James (1 September 2005). "O'Leary happy with Nobby deal". Sky Sports. Retrieved 29 July 2007. ↑ Buckingham, Mark (1 September 2005). "O'Leary to improve Milner". Sky Sports. Retrieved 29 July 2007. ↑ Higham, Paul (20 September 2005). "Villa comeback stuns Wycombe". Sky Sports. Retrieved 29 July 2007. 1 2 Buckingham, Mark (4 October 2005). "Milner upbeat for Villa". Sky Sports. Retrieved 29 July 2007. ↑ Rutledge, Lewis (14 April 2006). "O'Leary joy at Milner return". Sky Sports. Retrieved 30 July 2007. ↑ Buckingham, Mark (24 December 2005). "Milner waits on future". Sky Sports. Retrieved 30 July 2007. ↑ Livie, Alex (24 November 2005). "O'Leary expects to lose Milner". Sky Sports. Retrieved 30 July 2007. ↑ Buckingham, Mark (23 December 2005). "Villa out of Huth chase". Sky Sports. Retrieved 30 July 2007. ↑ "Glenn Roeder has again said that James Milner's future lies at St James' Park". fansfc.com. 27 June 2006. Retrieved 26 January 2008. ↑ "Milner move to Villa is in doubt". BBC Sport. 22 May 2006. Retrieved 17 October 2007. ↑ Jackson, Phil (14 June 2006). "Villa no to Barry-Milner swap". Sky Sports. Retrieved 30 July 2007. 1 2 Buckingham, Mark (31 August 2006). "Roeder backs Milner stance". Sky Sports. Retrieved 11 August 2007. ↑ "O'Neill upset over Milner episode". BBC Sport. 1 September 2006. Retrieved 17 October 2007. ↑ "Sol hails return of young gun Milner". officialplayersites. 14 July 2006. Retrieved 13 August 2007. ↑ O'Rourke, Peter (4 December 2006). "Milner expects Toon stay". Sky Sports. Retrieved 30 July 2007. ↑ Chowdhury, Saj (1 January 2007). "Newcastle 2–2 Man Utd". BBC Sport. Retrieved 30 July 2007. ↑ Hackett, Robin (24 April 2007). "Roeder hails dynamic Milner". Sky Sports. Retrieved 30 July 2007. ↑ Scurr, Andrew (30 December 2006). "Roeder Rejects Milner Exit Talk". Sky Sports. Retrieved 11 August 2007. ↑ Higham, Paul (31 January 2007). "Toon see-off Villa challenge". Sky Sports. Retrieved 30 July 2007. ↑ "Milner deal may be Sam's best move". icnewcastle. 14 June 2007. Retrieved 30 July 2007. ↑ "Milner is Sam happy player". icnewcastle. 17 August 2007. Retrieved 30 July 2007. ↑ Spellman, Damian. "Milner Burnout Not An Option". sportinglife. Retrieved 15 October 2007. ↑ "Milner Marks Magpie Milestone". Newcastle United F.C. 23 October 2007. Retrieved 23 October 2007. ↑ "Milner steals fortunate point". Sky Sports. 10 November 2007. Retrieved 20 December 2007. ↑ Slatcher, Laura (15 December 2007). "Allardyce belief in Milner". Sky Sports. Retrieved 20 December 2007. ↑ Oliver, Alan (13 May 2008). "Milner's ordered to take a break". Evening Chronicle. Retrieved 13 May 2008. ↑ "Milner in shock Anfield move". lep.co.uk. 11 May 2008. Retrieved 13 May 2008. ↑ "PFA backing client Milner". Sky Sports. 27 August 2008. Retrieved 27 August 2008. ↑ "James Milner: I thought it was a joke when Newcastle halted Villa move". London: Birmingham Post. 29 August 2008. Retrieved 29 August 2008. ↑ "Villa sign Milner from Newcastle". BBC Sport. 29 August 2008. Retrieved 29 August 2008. ↑ McKenzie, Andrew (31 August 2008). "Aston Villa 0–0 Liverpool". BBC Sport. Retrieved 1 September 2008. ↑ Shea, Julian (4 January 2009). "Gillingham 1–2 Aston Villa". BBC Sport. Retrieved 4 January 2009. ↑ Lillywhite, Jamie (17 January 2009). "Sunderland 1–2 Aston Villa". BBC Sport. Retrieved 8 February 2009. ↑ Sanghera, Mandeep (7 February 2009). "Beckham returns to England squad". BBC Sport. Retrieved 8 February 2009. ↑ Chowdhury, Saj (12 April 2009). "Aston Villa 3–3 Everton". BBC Sport. Retrieved 18 June 2009. ↑ "Milner: Stability suits me". Premier League. 9 October 2009. Retrieved 19 May 2010. ↑ McCarra, Kevin (2 September 2009). "James Milner makes most of England chance after his long wait". The Guardian. London. Retrieved 29 May 2010. ↑ "Aston Villa 3 Hull 0: Gareth who? James Milner filling Barry's boots at Villa Park". Daily Mail. London. 7 December 2009. Retrieved 5 March 2014. ↑ "PREMIER LEAGUE PLAYERS OF THE SEASON – Club-by-club guide to the stars of 2009–2010". Daily Mail. London. 4 June 2010. Retrieved 5 March 2014. ↑ "PFA ' proud' of Young Player of the Year James Milner". The Daily Telegraph. London. 26 April 2010. ↑ Ducker, James (20 May 2010). "Manchester City lodge £20m bid for James Milner". The Times. London. Retrieved 20 May 2010. ↑ "Milner can leave". Sky Sports. 22 July 2010. Retrieved 17 August 2010. ↑ "Kevin MacDonald defends decision to pick James Milner". BBC Sport. 14 August 2010. Retrieved 14 August 2010. ↑ "James Milner completes his transfer to Manchester City". BBC Sport. 18 August 2010. Retrieved 19 August 2010. ↑ Stuart, James (17 August 2010). "Manchester City agree deal to sign James Milner from Aston Villa". The Guardian. London. Retrieved 17 August 2010. ↑ McNulty, Phil (23 August 2010). "Man City 3–0 Liverpool". BBC Sport. Retrieved 23 August 2010. ↑ Fletcher, Paul (9 January 2011). "Leicester 2 – 2 Man City". BBC Sport. Retrieved 5 February 2011. ↑ "Manchester City vs Stoke City – Team line-up & ratings". Eurosport. Yahoo!. 14 May 2011. Retrieved 31 May 2012. ↑ "Manchester United 1–6 Manchester City". BBC Sport. 23 October 2011. Retrieved 31 May 2012. ↑ "Man City 3–0 Sunderland" Archived 14 January 2016 at the Wayback Machine.. BBC Sport. 6 October 2012. Retrieved 6 October 2012. ↑ "West Brom 1–2 Man City". BBC Sport. 20 October 2012. Retrieved 14 April 2014. ↑ "Arsenal 0–2 Manchester City" Archived 4 January 2016 at the Wayback Machine.. BBC Sport. 13 January 2013. Retrieved 27 January 2013. ↑ "Manchester United 1–2 Manchester City" Archived 16 October 2015 at the Wayback Machine.. BBC Sport. 8 April 2013. Retrieved 13 September 2013. ↑ "Bayern Munich 2–3 Manchester City" Archived 16 October 2015 at the Wayback Machine.. BBC Sport. 10 December 2013. Retrieved 10 December 2013. ↑ Kane, Desmond (10 December 2013). "Champions League – Man City hit back to claim famous win in Munich – Yahoo Eurosport UK". Uk.eurosport.yahoo.com. Retrieved 12 May 2014. ↑ "James Milner: Liverpool agree deal for Manchester City midfielder". BBC Sport. 4 June 2015. Retrieved 4 June 2015. ↑ Carroll, James (4 June 2015). "Liverpool agree deal to sign Milner". Liverpool Football Club. Retrieved 4 June 2015. ↑ "Milner confirmed as Reds' vice-captain". Liverpool F.C. 7 August 2015. Retrieved 7 August 2015. ↑ "Stoke 0–1 Liverpool". BBC Sport. 9 August 2015. Retrieved 10 August 2015. ↑ "Arsenal 0-0 Liverpool FC: player ratings - James Milner and Philippe Coutinho impress in Emirates stalemate". Liverpool Echo. 24 August 2015. ↑ "Liverpool 3-2 Aston Villa". BBC Sport. Retrieved 26 September 2015. ↑ "James Milner Player Profile". Espn Fc. Retrieved 2016-09-26. ↑ Cox, Gerry (30 March 2004). "Chopra earns U21s draw". The Football Association. Retrieved 20 June 2007. ↑ Hatherall, Chris (8 October 2006). "Bent does it again". The Football Association. Retrieved 2 October 2007. ↑ Richard, Bright (7 September 2006). "Milner grabs late winner". The Daily Telegraph. London. Retrieved 19 January 2011. ↑ Wilson, Jeremy (21 June 2007). "England go out after 32-penalty shoot-out drama". The Guardian. London. Retrieved 23 August 2007. ↑ "England U21 v Romania U21". BBC Sport. 21 August 2007. Retrieved 21 August 2007. ↑ "International – Milner battles Under-21 curse". Eurosport. 21 August 2007. Archived from the original on 23 August 2007. Retrieved 21 August 2007. ↑ "Rep of Ire U21 0–3 England U21". BBC Sport. 16 October 2007. Retrieved 17 October 2007. ↑ "England U-21 3–0 Rep of Ire U-21". BBC Sport. 5 February 2008. Retrieved 5 February 2008. ↑ Winter, Henry (15 June 2009). "England U21 2 Finland U21 1: match report". The Daily Telegraph. London. Retrieved 19 January 2011. ↑ Stevenson, Jonathan (18 June 2009). "England U21 2–0 Spain U21". BBC Sport. Retrieved 6 July 2009. ↑ Winter, Henry (26 June 2009). "England U21 3 Sweden U21 3: match report". The Daily Telegraph. London. Retrieved 19 January 2011. ↑ "England Camp Is 'Hurting' After European Under-21 Final Defeat – James Milner". Goal.com. 30 June 2009. Retrieved 6 July 2009. ↑ "James Milner". The Football Association. Retrieved 31 May 2012. ↑ McNulty, Phil (12 August 2009). "Netherlands 2–2 England". BBC Sport. Retrieved 13 August 2009. ↑ McNulty, Phil (12 June 2010). "England 1–1 USA". BBC Sport. Retrieved 17 August 2010. ↑ "England advances at World Cup, beats Slovenia 1–0". Nation News.com. 23 June 2010. Retrieved 17 August 2010. ↑ "Euro 2012: Roy Hodgson confirms England squad with Danny Welbeck and Glen Johnson deemed fit to travel". The Daily Telegraph. London. 29 May 2012. Retrieved 31 May 2012. ↑ McNulty, Phil (26 May 2012). "Norway 0–1 England". BBC Sport. Retrieved 31 May 2012. 1 2 McNulty, Phil (7 September 2012). "Moldova 0–5 England". BBC Sport. Retrieved 22 April 2016. ↑ "James Milner retires from England duty after discussions with Sam Allardyce". Guardian. 5 August 2016. Retrieved 5 August 2016. ↑ "Take your pick". The Football Association. 28 June 2005. Retrieved 12 September 2007. 1 2 3 4 Stewart, Rob (10 May 2010). "James Milner". The Daily Telegraph. London. Retrieved 19 January 2011. ↑ "Sol hails return of young gun Milner". Officialplayersites. 14 July 2006. Retrieved 29 July 2007. ↑ Sid Lowe. "Manuel Pellegrini: I've never felt that if I don't win I'm out at Manchester City | Football". The Guardian. Retrieved 2016-09-26. 1 2 "James Milner". everything2. 2 January 2003. Retrieved 12 September 2007. ↑ Gilder, Paul (3 November 2006). "Palermo 0, Newcastle United 1". icnetwork. Retrieved 13 September 2007. ↑ "We deserve all this flak, admits Given". The Northern Echo. Darlington. 28 December 2004. Retrieved 13 September 2007. ↑ "Profile". Newcastle United F.C. Retrieved 29 July 2007. ↑ "Milner: I've hated the long wait". icnetwork. 11 August 2007. Retrieved 13 August 2007. ↑ "James Milner News and Statistics". footballanorak. Retrieved 31 July 2007. ↑ "James Milner puts himself forward to go back into defence for England boss Fabio Capello". Daily Mail. London. 1 March 2010. Retrieved 3 December 2011. ↑ "Games played by James Milner in 2002/2003". Soccerbase. Centurycomm. Retrieved 22 April 2016. 1 2 "Games played by James Milner in 2003/2004". Soccerbase. Centurycomm. Retrieved 22 April 2016. ↑ "Games played by James Milner in 2004/2005". Soccerbase. Centurycomm. Retrieved 22 April 2016. 1 2 "Games played by James Milner in 2005/2006". Soccerbase. Centurycomm. Retrieved 22 April 2016. ↑ "Games played by James Milner in 2006/2007". Soccerbase. Centurycomm. Retrieved 22 April 2016. ↑ "Games played by James Milner in 2007/2008". Soccerbase. Centurycomm. Retrieved 22 April 2016. 1 2 "Games played by James Milner in 2008/2009". Soccerbase. Centurycomm. Retrieved 22 April 2016. ↑ "Games played by James Milner in 2009/2010". Soccerbase. Centurycomm. Retrieved 22 April 2016. 1 2 "Games played by James Milner in 2010/2011". Soccerbase. Centurycomm. Retrieved 22 April 2016. ↑ "Games played by James Milner in 2011/2012". Soccerbase. Centurycomm. Retrieved 22 April 2016. ↑ "Games played by James Milner in 2012/2013". Soccerbase. Centurycomm. Retrieved 22 April 2016. ↑ "Games played by James Milner in 2014/2014". Soccerbase. Centurycomm. Retrieved 22 April 2016. ↑ "Games played by James Milner in 2014/2015". Soccerbase. Centurycomm. Retrieved 22 April 2016. ↑ "Games played by James Milner in 2015/2016". Soccerbase. Centurycomm. Retrieved 2 June 2016. ↑ "Games played by James Milner in 2016/2017". Soccerbase. Centurycomm. Retrieved 17 November 2016. 1 2 "Milner, James". National Football Teams. Retrieved 11 June 2016. 1 2 3 4 5 "J. Milner". Soccerway. Perform Group. Retrieved 19 September 2016. ↑ "Milner Takes Young Player Prize". Skysports.com. 25 April 2010. Retrieved 25 April 2010. ↑ Bellwood, Tom (27 April 2010). "Wayne Rooney leads the charge as Manchester United dominate PFA Team of the Year". Daily Mail. London. Retrieved 25 May 2010. Wikimedia Commons has media related to James Milner.